Car sales may be slowing a little bit, but if so, you can't blame Volkswagen, which has been handing out cash to hundreds of thousands of "clean diesel" owners. 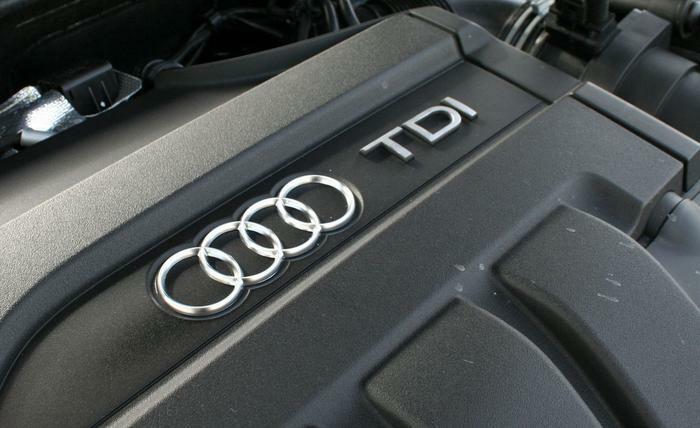 The latest settlement, expected to total about $1 billion, will line the pockets of consumers who owned or leased a 3.0-liter TDI VW, Audi, or Porsche from certain model years. VW earlier agreed to pay nearly $20 billion to buy back cars and settle civil and criminal charges growing out of its use of deceptive software that allowed its TDI "clean diesel" cars to pass emissions tests, even though they spewed out as much as 40 times the legal limit of pollutants. Most of the nearly 600,000 vehicles involved were equipped with 2.0-liter diesel engines. Today's settlement covers larger vehicles equpped with 3.0-liter engines, which were equipped with similar illegal devices. Under today's settlement, VW will fully compensate consumers who purchased 3.0-liter TDI diesel vehicles through a combination of repairs, additional monetary compensation, and buybacks for certain models. Under the federal court order, owners of older vehicles (model years 2009-2012) will be able to sell their car back to Volkswagen at favorable prices and obtain full compensation for their losses. Consumers are eligible to receive approximately $26,000 to $58,000 for a buyback, depending on the model, mileage, and trim of the car. These owners can also opt to keep their cars and receive an emissions modification that would improve their vehicle’s emissions, if a modification is approved by the Environmental Protection Agency and the California Air Resources Board. Consumers receiving an emissions modification will also receive monetary compensation. 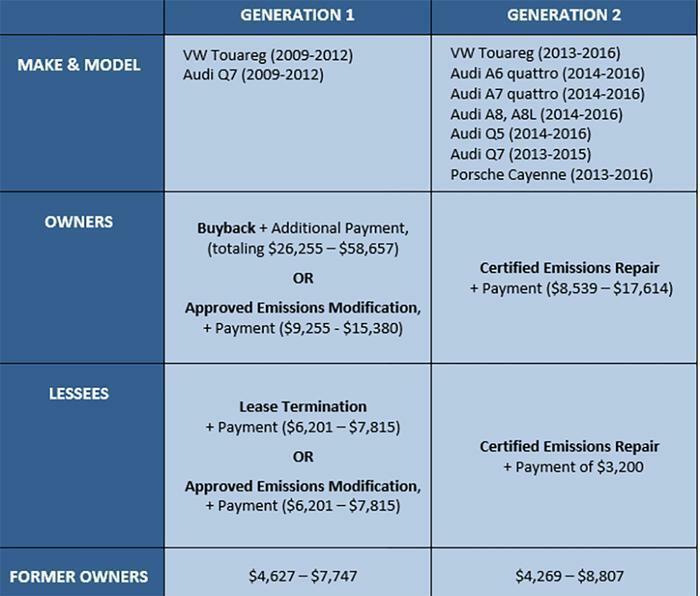 For owners and lessees of newer vehicles (model years 2013-2016; see detailed fact sheet) Volkswagen is expected to obtain regulatory approval for an emissions repair that brings the cars into full compliance with originally certified emission standards and does not materially reduce the performance of the vehicle. If Volkswagen obtains EPA and CARB approval within the timeframe in the FTC Order, consumers will receive this repair and additional monetary compensation ranging from approximately $8,500 to $17,600. This means consumers with newer vehicles will receive the car they thought they purchased – plus a substantial additional payment. If an emissions repair is not available under the timeframe in the FTC Order, then Volkswagen must offer to buy back those models and provide lease terminations. Certain consumers who leased an affected vehicle are eligible for substantial compensation. Options for lessees vary based on make, model, model year, and the availability of approved emissions modifications or repairs. Certain owners who sold their TDI vehicles after the Volkswagen defeat device issue became public are also eligible for compensation. This chart shows the range of approximate payments consumers would receive under the FTC Order. The order will return more than a billion dollars to consumers, with the total amount depending on future events. If no emissions repair is approved, and if the company must therefore offer buybacks for all 3.0-liter TDI models, Volkswagen may have to pay as much as $4 billion. Volkswagen's court-enforced largesse is being compared to the "cash for clunkers" program the federal government rolled out during the recession, hoping to spur sales and get high-polluting older cars off the road. The federal program doled out about $3 billion. Depending on how many cars it buys back or repairs, VW could hand out as much as $10 billion to American consumers, not to mention the billions it has paid in federal and state fines. While all of this is sort of bad news for Volkswagen, it's good news for the automobile industry, which has seen sales slowing slightly in recent months, and not quite as disastrous for VW as you might expect. Experts quoted recently by Bloomberg say they expect Volkswagen and Audi sales to show an increase of about 20 percent for January, followed by Honda with four percent, while other major brands all see decreases. It might seem surprising that Volkswagen owners would be sticking with the brand even after the diesel scandal. But VW has always enjoyed exceptional customer loyalty and TDI owners generally loved their cars, which were noted for their excellent fuel economy, spirited acceleration, and good handling. "I vowed never to buy another Volkswagen product after the diesel disaster," said one Southern California motorist who was refueling a Tiguan recently. "But after I drove a Honda and a Toyota, I headed over to the VW dealer and drove home in my third Jetta." VW's various court settlements prohibit it and its dealers from encouraging consumers getting buybacks to buy another Volkswagen, but the German automaker still managed to dethrone Toyota as the world's largest-selling car manufacturer last year.